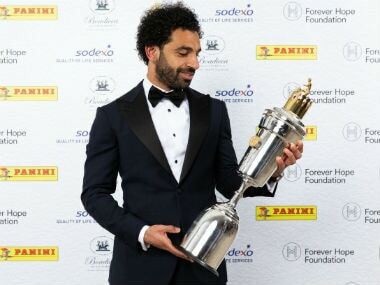 London: Mohamed Salah was crowned the Premier League's Players' Player of the Year on Sunday, with his incredible 41-goal debut season at Liverpool beating out strong competition from Manchester City's Kevin de Bruyne. "It's a big honour. I've worked hard and I'm very happy to win it," Salah said at the ceremony on Sunday evening. "You're comparing your name with some great names," he said, on the prospect of breaking the record. "To break the Premier League record is something huge in England and all over in the world. "There are still three games to go. I want to break this record." Salah has also netted seven times in eight Champions League games, including in both legs of Liverpool's 5-1 quarter-final thrashing of City, to carry his side to a first semi-final for a decade. De Bruyne showed why he had been many people's early-season favourite for the prize with an incredible long-range strike for his 12th goal of the season to go with a league-high number of assists as champions City thrashed Swansea 5-0 on Sunday. 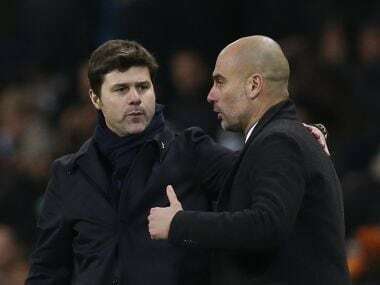 "From my point of view when you are analysing 10 months, there is no player better than him," said City manager Pep Guardiola of the Belgian midfielder. "Maybe there are numbers better but for me he was the best. But it is my opinion, the opinions of the players could be different. But in the end, in summer time he will be at home being champion."